As soon as you take a look at the Patch theme by Pixelgrade you can see that it is totally unique. I don’t think I’ve seen a theme quite like it before. At first glance it may look like some other magazine WordPress themes but when you notice the subtle details you can see just how unique it is. Newspaper-inspired, Patch makes a clear statement for all the digital writers: you can level up your content by wrapping it into an outstanding design. I totally agree with that statement. If you’re a writer looking for a great design to show off your work this may be the perfect theme for you. I think this theme would work especially well for anyone who creates long form content. Just take a look at the article pages in the demo and you will see right away how great content can look. Pixelgrade have done a seriously good job with the design of this theme. Anyway, enough drooling over the looks, how about the functionality? 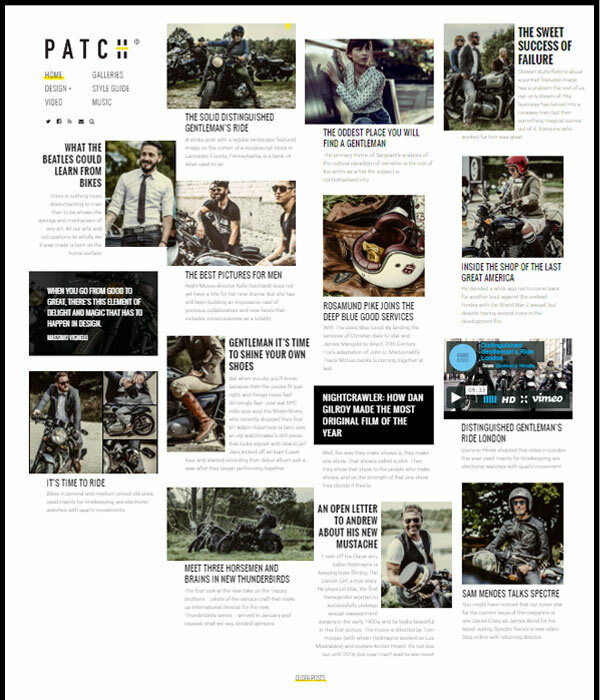 Well Patch has all the functionality you would want in a magazine theme and like most themes I’m a big fan of the admin area is simple and effective and the code is top notch. The customizer is used to set options for the theme and Pixelgrade have done a great job making the customizer look and feel great whilst still keeping things easy to understand. Another thing you’ll notice when you take look at Patch is the price tag. At $125 it’s over twice the price of regular themes but you really do get what you pay for and I think that $125 is completely fair price for the majority of WordPress themes as I know exactly how much effort goes into creating them. When you factor in Pixelgrade’s awesome support, money back guarantee, fantastic theme and top notch code $125 is a bargain so I’d recommend snapping this up if you are a writer looking for a WordPress magazine or blog theme. This theme looks so cool. The price does seem steep though. I think i’ll see if I can find anything else I like as much before I commit.